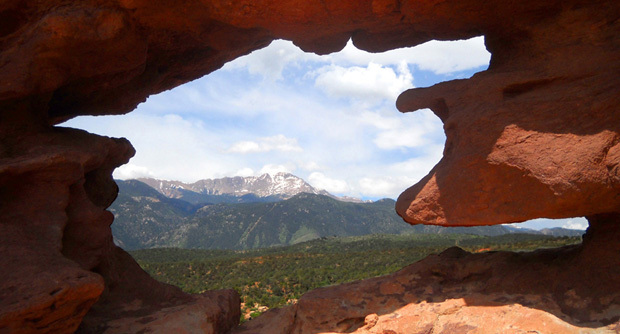 nearly a million acres of natural beauty, history, and unforgettable adventures. Enjoy." 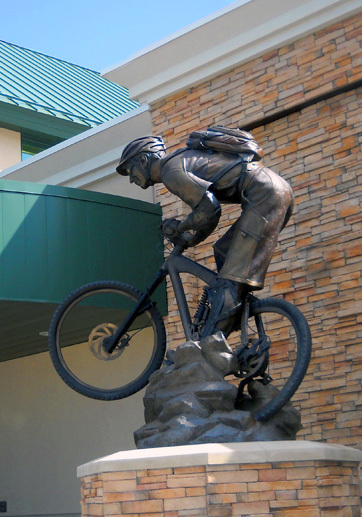 Rapid City, with a population of about 70,000 people (more if you include the adjacent town of Box Elder and Ellsworth Air Force Base), functions as a trading center and tourist headquarters for the Black Hills area. It was founded in 1876, two years after gold was discovered nearby. note the dark green "spruce trees" that give the region its name. 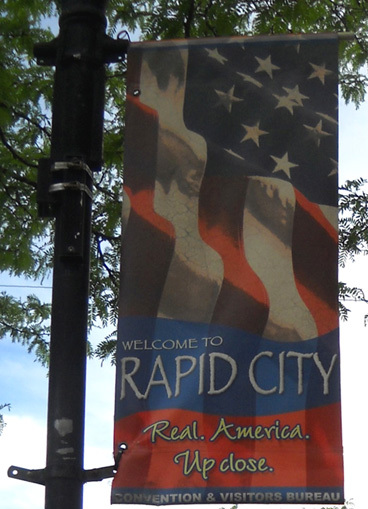 We have visited Rapid City several times. 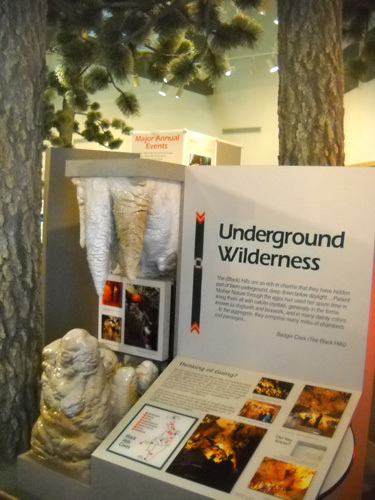 Each time we discover more to love about the area -- unique national parks like Wind Cave and Mt. Rushmore, fascinating Custer State Park, legendary Black Hills towns, scenic lakes and forest trails, beautiful city green spaces. It's also one of those places that feel like "home" to us, not just because our mailing service is located here, but also because of all the great scenery, nice people, and things we like to do nearby. We always feel welcome when we're in the area. 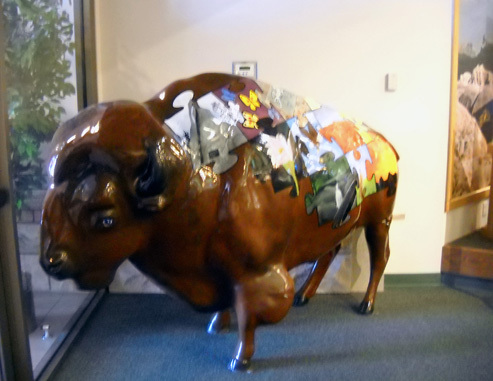 An artistic rendering of a bison, iconic symbol of the Black Hills area, greets you at the door. Eleven days isn't nearly enough time for us to do everything we want to do here this year so we plan to return in September for another couple of weeks. One of the highlights of that visit will be to witness the huge annual buffalo roundup in Custer State Park on September 26. Where else can you see that? 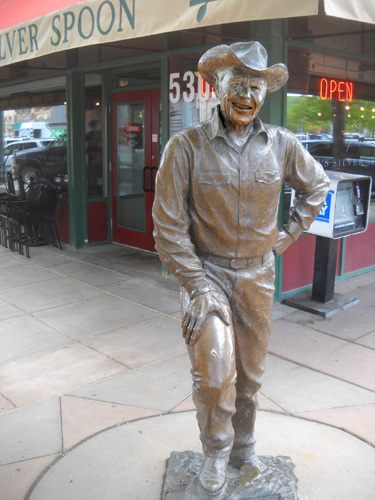 In this entry I'll show you some scenes from Rapid City that we enjoyed during this visit. Since we aren't big shoppers or restaurant-goers, most of our activities involve outdoor exploration. I'll talk about those little adventures in the next entries. 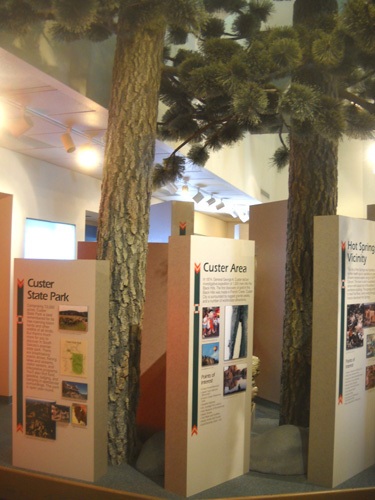 A good place to begin any visit to an area is its visitor center. 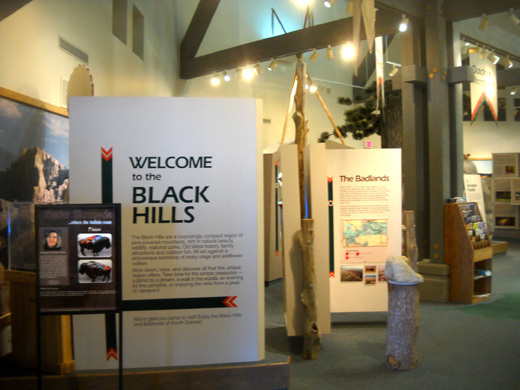 For some reason we haven't gone to Rapid City's excellent Black Hills Visitor Information Center, located at exit 61 on I-90, until this trip. 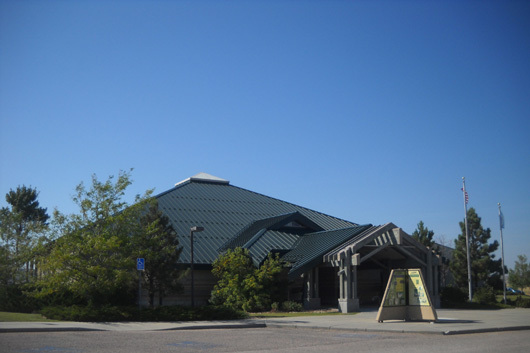 It's state-of-the-art and full of interesting interpretive displays about the geology and history of the area, tons of brochures about things to do and see, a giant relief map of the Black Hills, interesting maps and books to purchase, and knowledgeable folks to answer your questions. A relief map of the Black Hills area is in the foreground above. I liked the place so much, I went back a second time to learn even more. 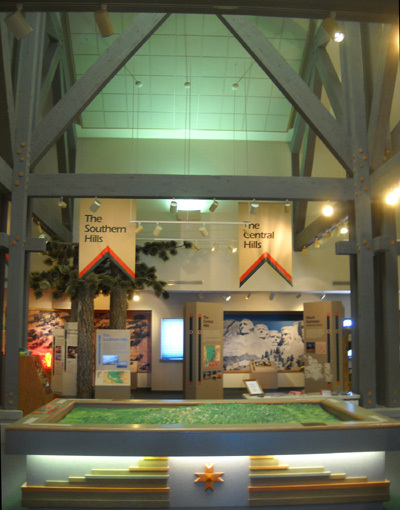 The visitor center is half museum. I came out with a dozen free trail maps, several brochures, and lots of inspiration for things to do on this and subsequent visits. Just down the access road from the magnificent visitor center is the magnificent new headquarters for our mailing service, America's Mailbox. It's also near Ellsworth AFB, where we're camped, so we've stopped in several times while we've been here to get our mail, chat with the staff, and check out the new facilities. to the new America's Mailbox facility. The company is run by a couple named Don and Barb who were full-time RVers before they started the whole process of building a new place for their business. That's consumed more than a year of their time. Once the dust settles, they intend to hit the road again and leave the details of the operation to their capable staff. America's Mailbox. Note the large "WELCOME HOME" in the background. This is a neat American small-business success story. 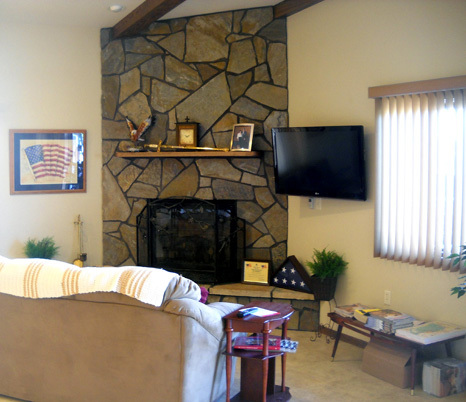 As full-time RVers, the couple saw the need for a reliable way for folks who either do not have a sticks-and-bricks residence -- or who are away from their residence for long periods of time -- to receive their mail. Most of their 3,000 or so members are full-time or extended-travel RVers like us. They also cater to folks in the military, long-distance truckers, visiting nurses, construction workers, traveling sales(wo)men, and other people who are on the road or water (some people live in their boats) most or all of the time. 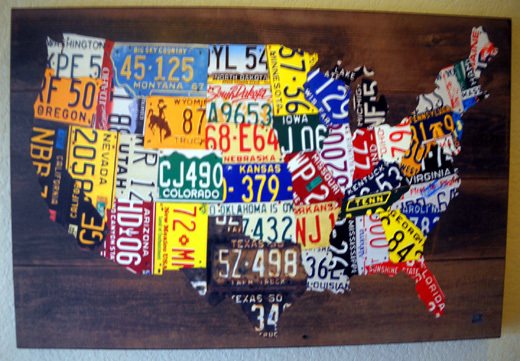 through which America's Mailbox members travel. In addition, they provide assistance to folks who want to make South Dakota their legal residence. They are full of information about how to do everything yourself, from obtaining a driver's license to registering to vote. For a reasonable fee, they will do the actual legwork -- if you want them to -- for some tasks like registering your vehicles so you don't have to stand in long lines at the various county offices. Don and Barb have done a good job and their business has steadily grown. 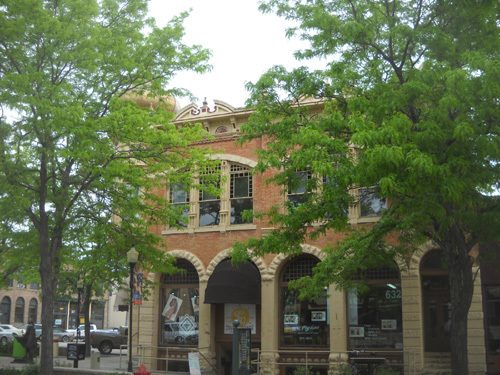 In fact, they completely outgrew the scattered rooms they leased in an old building in downtown Rapid City, which we saw when we first became members in early 2009. The newly-planted grass at the brand new building should be more lush in a few weeks. 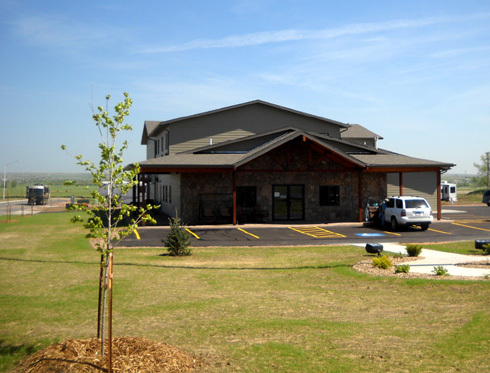 So they purchased some land on the outskirts of town and built a new facility (above) that should take care of their mail handling and other needs for years to come. They also added about twenty RV campsites for current and potential members who are visiting the area and built some guest suites for folks who come without a camper. The new building just opened in mid-May; we were two of the first customers to see it. 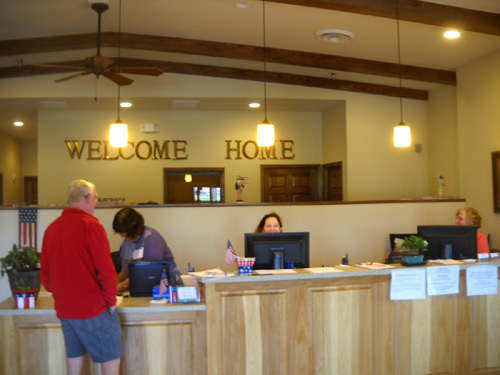 We are impressed -- what an improvement over the old rented spaces! The owners and employees love it. No longer do they have to run run up and down stairs to different cramped rooms to sort and distribute the mail and handle other aspects of their business. The campsites will be convenient for America's Mailbox members and wannabes who visit the area. However, the sites are not seeded with grass yet because the utility work isn't completed (long winter, lots of rain and snow). The sites have been muddy while we've been here but several folks are using them already (next photo). They should be nicer when the grass comes up and all the work is done. I'll give a progress report the next time we're here. These campsites aren't finished yet but there is obviously a need for them. 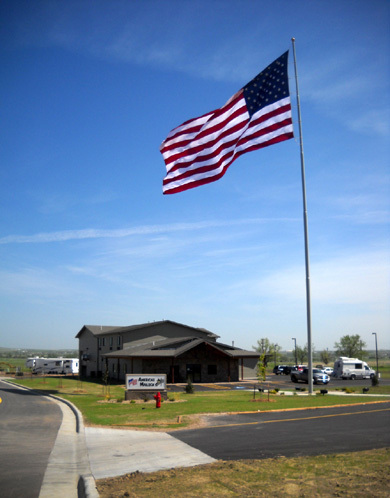 Although America's Mailbox camping fee is less than some other private campgrounds in the area we prefer to stay at Ellsworth AFB when we want to be close to Rapid City. The cost is lower at the FamCamp, the sites are much larger, they aren't right next to a freeway, and we have access to many miles of roads and trails right out our door. 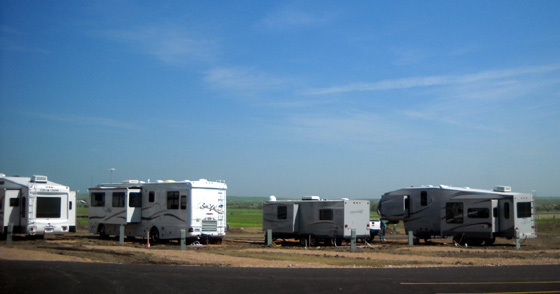 The Ellsworth AFB FamCamp is perfect for RVers who are current or retired military personnel. Otherwise, for current or potential America's Mailbox customers, try their new facilities when you're in town. Jim and I aren't much into shopping or eating out so we can't recommend any unique stores or restaurants in Rapid City or the Black Hills area. We are quite happy to shop in places you can find most everywhere, like Walmart, Sam's Club, Cabella's, Scheels (a western sporting goods chain), Petsmart, and such. They were wise to include historical information about the two presidents and some of their famous quotes. It's an easy history lesson for those who take the time to read them. As you'll see in a minute, this city is big on our former presidents. 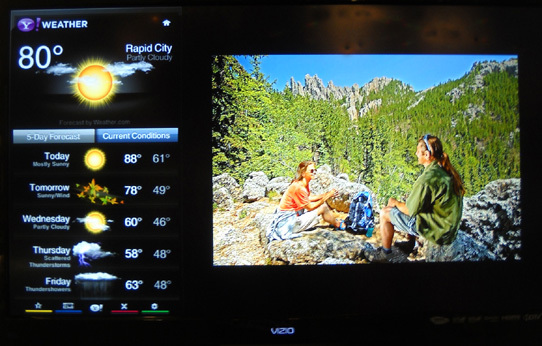 You can find all the stores I mentioned above and many other popular chain stores in Rapid City. In fact, people come from five states to patronize those stores and take advantage of other amenities (cultural, medical, sports, etc.) not found in their own smaller communities. We found the same phenomenon when we lived in Billings, MT. There just aren't a lot of business hubs in these sparsely-populated northern Plains and mountain states so people drive for dozens or hundreds of miles to small cities like Billings and Rapid City to find what they need. If you live east of the Mississippi River, this concept may be hard for you to grasp! which birds were real and which were painted on the sign! 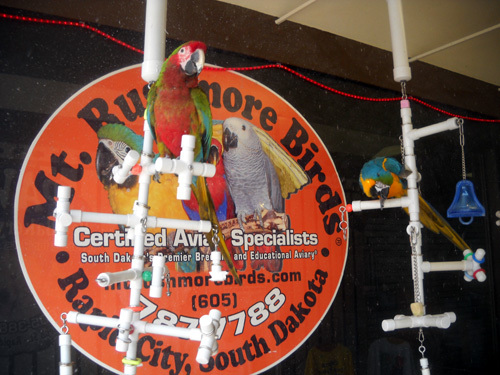 Meanwhile, visitors can also find plenty of unique local boutiques and eateries in Rapid City, if that is their choice. The place has something for just about everyone. Jim and I do enjoy seeing local parks and bike trails, architecture, historical sites, museums, and art in the places we visit. I'd like to share some of those things that we saw recently during leisurely walks and drives through Rapid City. Some cities have inviting downtown areas that are a pleasure to visit. 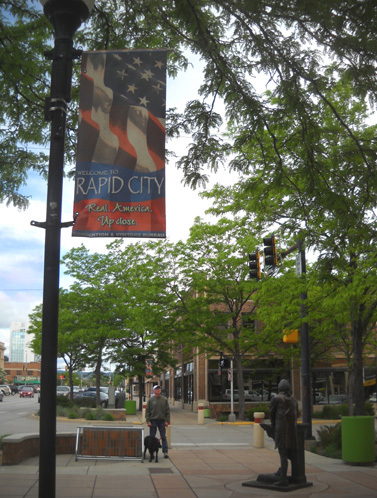 Rapid City is so nicely landscaped and it has such a variety of architectural styles that it's a treat to walk or drive through. 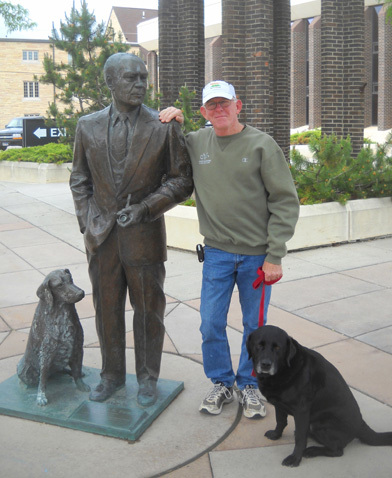 There's another reason it is visitor-friendly -- the life-size bronze renditions of 42 of our previous presidents. If you aren't aware they are there, it's a nice surprise to find them. 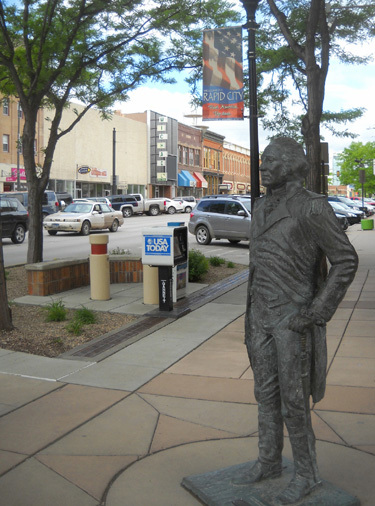 George Washington presides over the intersection at St. Joe and 6th St. 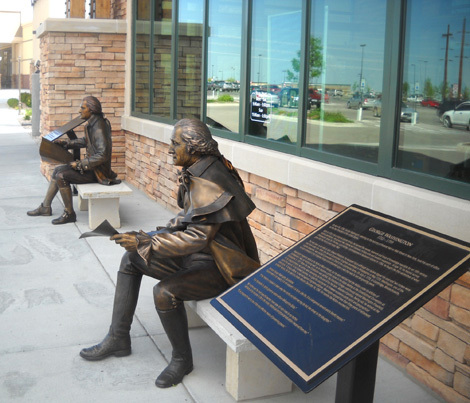 Many cities have interesting public art on display; Rapid City's public art features former leaders from Washington to Clinton, playing off the area's proximity to Mt. Rushmore National Memorial. The project, begun in 2000, is called the City of Presidents. 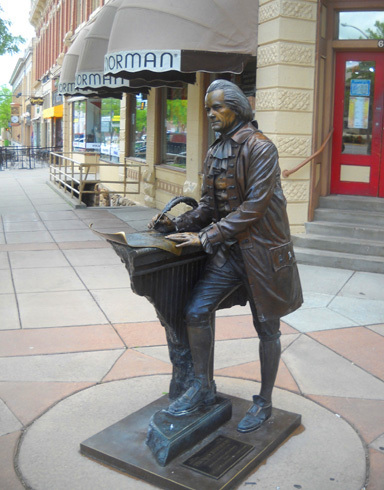 It's just downright fun to walk up and down Main and St. Joseph streets between 4th and 9th -- twelve intersections with one to four presidents gracing the corners, each in a representative historical pose. Oh, sure, you can drive up and down the streets and see them but it's much better to get out and walk. It's only a 12-block loop. 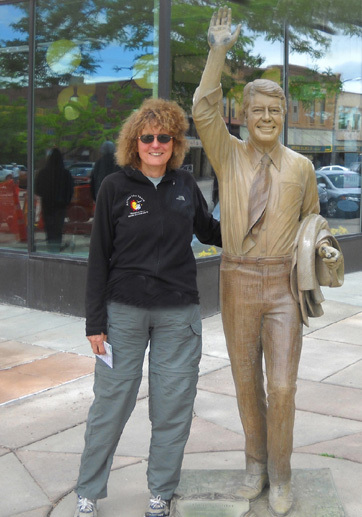 That way you can read the short blurbs about each president, admire the work of the five local sculptors who contributed to the project, and pose with your favorite fellas! 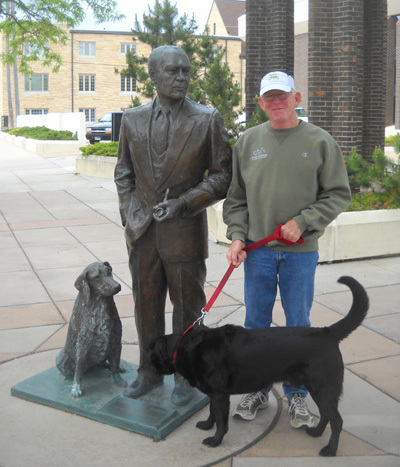 I had to pose with Jimmy Carter, who is the only president I've ever met in person. He presented me with an age group award at a road race we both ran in his hometown of Plains, GA back in the '80s. That was memorable. Even though I didn't vote for Carter it was cool having a laid-back president -- and a fellow runner, no less -- from the state in which I lived at the time. Continued on next page . . .